Chilli rating - medium. Perfect for chicken. Shared with love. No looking back. Gluten-free. No artificial preservatives, flavours or colours. Suitable for vegetarians. Halal. Kosher - KLBD. Peri-Peri (African Bird's Eye Chilli) joins the flavour party with lemon, garlic and spices. A fiery kick with a zesty zing. 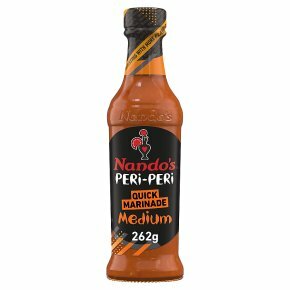 Delicious things come to those who wait... For the best experience, pour at least half of this bottle over 500g of chicken or meat and let it spend the night bathing in Peri-Peri goodness. When you're ready, barbecue, grill or cook to your heart's contents. For a real Peri-Peri punch, add an extra coat (or two) while cooking. Shake well before use. The bottle too.